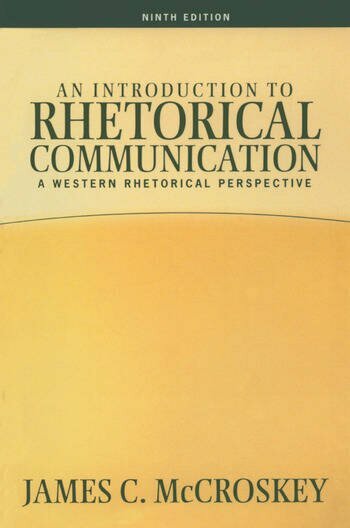 An Introduction to Rhetorical Communication offers a true integration of rhetorical theory and social science approaches to public communication. This highly successful text guides students through message planning and presentation in an easy step-by-step process. An Introduction to Rhetorical Communication provides students with a solid grounding in the rhetorical tradition and the basis for developing effective messages. 2. The Nature of Rhetorical Communication. 3. Stage Fright: A Normal Problem. 4. The Nature of the Receiver: Attitude Formation and Change. 5. Ethos: A Dominant Factor in Rhetorical Communication. 6. The Nature of Persuasive Argument. III. MESSAGE PREPARATION AND PRESENTATION. 9. Message Preparation: Preliminary Considerations. 14. Introducing and Concluding Messages in Rhetorical Communication. 15. Message Preparation: Oral Delivery. IV. RHETORICAL COMMUNICATION AND SOCIETY. 16. Ethics and Rhetorical Communication.